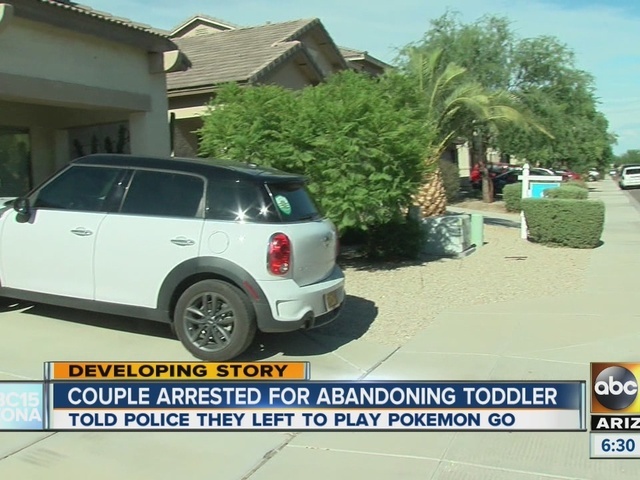 A San Tan Valley, Arizona, couple has been arrested after abandoning their 2-year-old boy outside their home to play Pokemon Go. According to the Pinal County Sheriff's Office, 25-year-old Brianna Daley and 27-year-old Brent Daley, were arrested for child endangerment and child neglect after their child was left alone for up to an hour and a half. A neighbor reportedly found the child around 10:30 p.m. on July 28. Deputies say he was locked outside of their house with no water when it was 96 degrees outside. He had only a diaper and t-shirt on and was distressed, according to PCSO. Deputies unlocked the door and searched for the child's parents, but did not find any sign of them. They found a phone number inside the home and reached the child's father, Brent, who reportedly responded, "Whatever" and hung up, after being told that they abandoned the boy. After an hour, the parents returned home and told deputies they left the child sleeping while they put gas in the car. “I just can't imagine that. I don't leave my kids alone for a second, not for any reason. I just don't get it,” said another neighbor, Katie Young. PCSO says both parents have admitted that they left the child to play the popular Pokemon game in nearby neighborhoods and parks.